Kevin Durant who represents Oklahama City Thunder was named the USA Basketball Male Athelete of the Year. This decision came on Wednesday, who he was categorically selected for this honour. He was instrumental in leading USA to the gold medal victory in Turkey at FIBA World Championship 2010. He scored the overall team best of 22.8 points/game which ultimately led Krzyzewski's team to a staggering 9-0 record. This as a result ended USA's 16 year drought to be honoured as the World Champions.Thunder's forward Durant got the unaminous MVP and headed the All-Tournment team. He scored 55.6% field shooting and 91.2% from free-throw line. He also provided 6.1 rebounds as well, 3.1 assists, and 1.4 steals in about 28.2 minutes/game.With USA Championship record 22.8 points/game, he also acheived U.S highs for points scored(205) and made and attempted field goals. He lists second all-time in U.S. records for attempted 3-point field goals, third for made 3-point field goals, fifth for made free throws, seventh for rebounds and 10th for attempted free throws.He along with other accoladed also set USA World Championship single-game records for points scored (38), field goals made and attempted (14-25 FGs) and 3-point field goals attempted (13).He scored 12 or more points in all nine of the USA's games, and five times he recorded 20 or more points and led his team in scoring. “My goal was to represent my country to the best of my ability. I really appreciate all the coaches and players that I got to share that experience with. 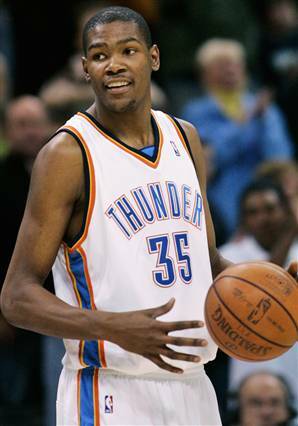 I am very humbled by this honour.”,Durant exclaimed his happiness. Coach Krzyzewski and USA Basketball Executive Director and CEO Jim Tooley are equivocal in expressing their heartfelt happiness. They were happy about his contribution to USA basketball team and how he helped the team achieving this marvelous achievment. This man keeps on improving. In 2007-08 season, he was picked as the Rookie of the year and yet this time he managed to grabbed another awesome title. Great job KD!